In the late eleventh century, on the island of Thasos, there was a holy ascetic named Luke, who at first lived in a place later called Louka for fourteen years, and there he built a small church dedicated to the Holy Apostle and Evangelist John the Theologian, where the village later was known as Theologou. 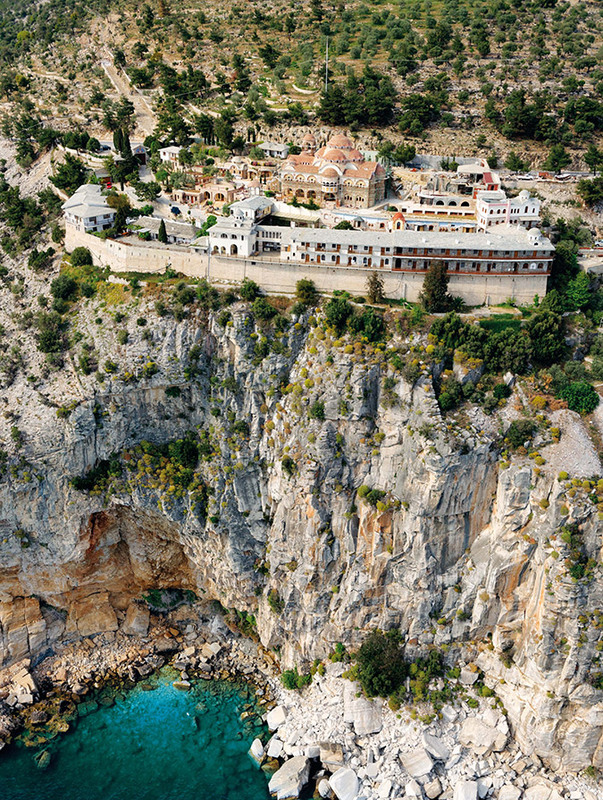 From there he decided to move to a quieter and more remote location, so he went to a cave in Potamias, where today there is a church dedicated to the Archangel Michael. He lived here in asceticism for twenty years. At around the seventeenth year, as Luke was praying, he saw before him the Archangel Michael in all his brilliance, who said to him, "Peace be with you." Frightened and amazed by this wondrous vision, the Saint said, "Most Holy Theotokos, help me." The Archangel told him to not be afraid, because he was not a phantasm, but the Archangel of God Michael, who was sent by the Lord to tell him, that in three years he would give up his spirit in peace, for his eternal repose. With this the Saint became more afraid, and he thought he was seeing a phantasm, so he fell on his face and began to cry out, "Lord have mercy!" To give the holy ascetic courage, the Archangel Michael struck a nearby stone with his rod, saying, "In the name of the Father and of the Son and of the Holy Spirit. Amen." Immediately the stone began to gush forth water. This gave courage to Luke, who then asked the Archangel for forgiveness for his previous disbelief, for many times has the devil deceived ascetics with visions of phantasms and tricks of the imagination. The Archangel then told him to drink of the water and not to be afraid of demonic fantasies, but to build a church at that spot for the benefit of many and the healing of the sick. Having said this, the Archangel vanished. The Elder in turn rose up full of joy, and thanked God for the divine command to build a church, which he did and dedicated to the Archangel Michael. And all those who visit this church and drink of the holy water with faith, are healed of their sicknesses and diseases. As news of this miracle spread and pilgrims came, after three years the Holy Elder Luke reposed in the Lord, as was foretold by the Archangel. His subordinate, whose name was Xenophon, buried his elder and departed for Mount Athos, where he settled in the Holy Monastery of Philotheou, and he remained there the rest of his life, for he was not able to live in the previous remote place by himself. Now the holy ascetic Luke had beheld his vision of the Archangel Michael during the reign of Emperor Nikephoros Botaneiates (1078-1081). Shortly after Constantinople fell to the Turks in 1453, the island of Thasos also fell. And hearing of the miracles of the Archangel Michael, three Turks decided to go up to the holy shrine and put an end to the holy spring. As one of them attempted to pollute the holy spring, he was immediately struck dead and the spring dried up. The other two descended back to their ship and left the island amid a storm at sea. The next day a priest named Demetrios came along with others who were ill, and when he saw the dead Turk and the spring dried up he and those with him became afraid and lamented. 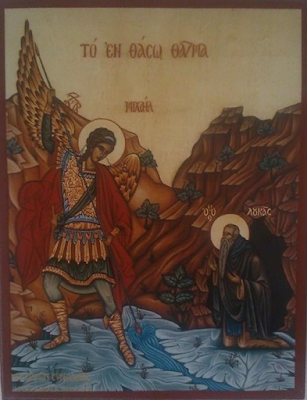 That night the Archangel Michael appeared to the priest Demetrios and said to him, "Go to my church and remove that impure body and cast it far away, and go with the sick to the seashore where you will see a light in a cave; enter and let the sick wash themselves and be healed." The priest then did a vigil and at Matins went to the church and removed the impure body, as the Archangel commanded, and he went to the seashore where there was a small cave and a great light, and he fearfully cried out, "Lord have mercy," and "Archangel help me." And entering the cave, which was small and tight, they had to get on their knees to reach the holy spring. For this reason the place is called Gonatais, because you have to get on your knees to reach the holy spring. The sick therefore bathed themselves in the holy spring and were healed, according to the word of the Archangel, and since this time the faithful have gone to this cave to be sanctified and healed from the holy spring. That day the priest Demetrios went and cleaned the church and sanctified it, celebrated the Divine Liturgy, and went back to the seashore. There he saw the wrecked ship of the two Turks, and their dead bodies on the seashore, and the priest narrated all that took place. (It should be noted that the holy spring in the cave is the same water from the holy spring in the church above, but it simply flowed into the cave below miraculously in order to escape being polluted by the Turks). When Mount Athos was under the Turks and burdened with heavy taxes, the fathers of Philotheou Monastery chose a hieromonk named Gabriel and sent him with two other monks to Wallachia, because the Christ-loving rulers of Wallachia greatly helped Mount Athos at this time. In return they brought with them certain holy objects from Philotheou Monastery, namely the Honorable Nail which pierced the right hand of our Lord Jesus Christ, which was given to the Monastery with a chrysobull by Emperor Nikephoros Botaneiates, and with this they also took a portion of the relic of Saint Panteleimon. Boarding a ship with these treasures, Hieromonk Gabriel and those with him departed for Constantinople, to receive a patriarchal letter on behalf of the Monastery for the ruler of Wallachia and the hierarchs there. Five miles from Mount Athos a storm arose at sea, which made them dock at Thasos, in Potamias where the dependency of Philotheou was located, near the Church of the Archangel Michael. Because pirates had burned this dependency down, they gathered up some of its treasures, such as the chrysobull of Emperor Andronikos Palaiologos given in 1287. As night fell the monks and sailors lit a fire and rested. But then pirates noticed their ship and came to them and slaughtered all of them in order to gain their treasures. 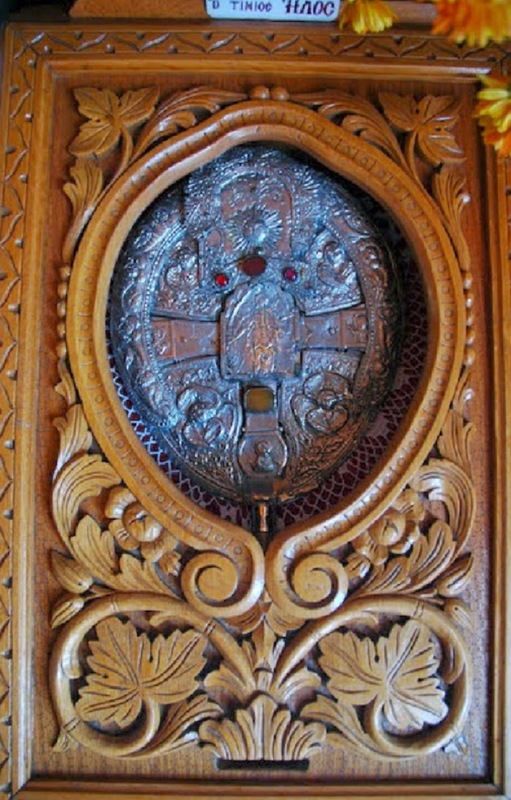 To keep the Honorable Nail and relic of Saint Panteleimon safe, they were placed in a hidden place in the wall of the church, and were not found by the pirates. As time went by, the treasures were discovered by divine economy in the following manner. There was an old man named John who was sick and could find no healing for his suffering. The Archangel Michael appeared to him in a dream and urged him to go to Gonatais to wash himself in the holy spring and be healed. He rose up, told his family about the vision, and went to the holy spring where he washed himself and was completely healed. After his healing he went to the church where the container with the holy relics were hidden in the walls, and he intended to rebuild the church. When he came to the wall and found the silver container, he took it to the other dependency of Philotheou Monastery in the village of Theologou on the island, and gave it to Elder Theonas of Philotheou. The Honorable Nail of the Savior was contained in a wooden Cross and John put it in a wild olive tree next to the Church of the Archangel Michael. He only presented the container with the relic of Saint Panteleimon, and the Elder told him that it was not the Honorable Nail and relic of Saint Panteleimon, since they could only be found under a tile. John gave them the silver container, but the fathers were ignorant of the location of the Honorable Nail in the wild olive tree. There was a certain shepherd nearby who nightly would see a bright light, and during the day would go to the location and find nothing. One night therefore he went with his son to the wild olive tree and saw the brilliant light, but they were too afraid to approach it. Instead they went to Theologou where they told Elder Theonas everything. Not much time had passed from the time the monks were slaughtered by the pirates and John was healed and rebuilt the church and discovered the holy relics. It therefore was realized by Elder Theonas that perhaps the Honorable Nail was in the wild olive tree, so they went there and found the Cross with the Nail in it. He reverently and honorable took it and processed it to Theologou, where all the villagers came, and it was placed in the church near the dependency. Many miracles began to take place there. When the Monastery of Philotheou found out about this, they wrote Elder Theonas and requested for the Honorable Nail to be brought back to the Monastery. Therefore Elder Theonas brought it back to Philotheou Monastery. But the Archangel Michael appeared in a dream to the Abbot of Philotheou, and rebuked him, and told him to have it returned to Thasos for the benefit of the Christians there. The Abbot hesitated to have it sent back. For this reason the Archangel appeared to him again in his dream and said that he would send it back, and for him not to ask for it again. The Abbot therefore went to the place he kept the Honorable Nail, and found that it was not there to his amazement. He therefore sent Elder Theonas back to Thasos. The shepherd who had found the Honorable Nail in the wild olive tree previously, once again saw a bright light on Bright Tuesday of Renewal Week at the seashore in the Church of the Archangel Michael, and found the Honorable Nail again, so he informed everyone about it, and they processed it to the church near the dependency in Theologou. After many years in 1866 there was a priest named Anastasios from the village of Voulgaron, who was heavily ill. Praying before the Honorable Nail and invoking its divine power, he was healed. In gratitude for this healing, he had an icon of the Archangel Michael made, and in it was placed the Honorable Nail together with the Cross it was placed in. Because the second discovery of the Honorable Nail took place on Bright Tuesday, it became the habit to annually celebrate its discovery on this day at the Church of the Archangel Michael near the seashore, at which a procession takes place with it and a Divine Liturgy is celebrated in Theologou.